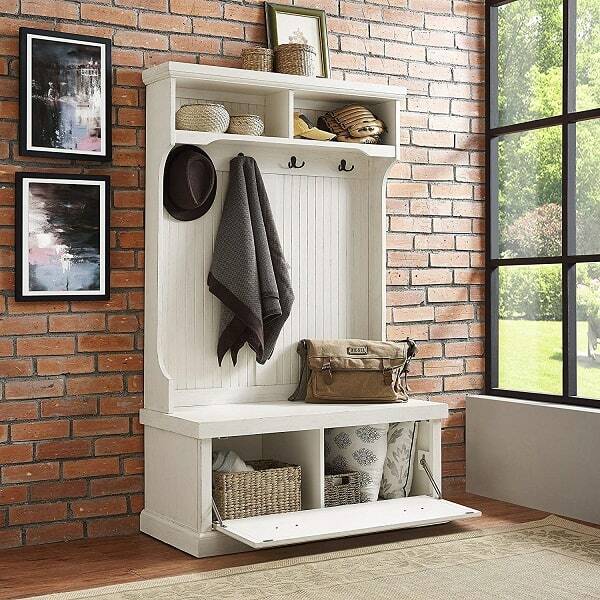 Capture the feeling of an effortless beach home with the Crosley Furniture Seaside Hall Tree. Have a seat on the full-sized bench seat, perfect for getting ready for the day. Constructed from solid hardwood and veneers, the weathered surface softens the classical lines and suits any home. Pull the drop-down drawers forward with the genuine metal hardware and find two spacious cubbies inside, perfect for storing shoes, scarves, and other clutter best kept out of sight. The tall, slatted back is equipped with hooks for hanging coats out of the way, and two more overhead cubbies offer space for decor or storage. How cute are these running shoes?? I love that they look totally different than your typical sneakers. And, these cute Running Shoes are an amazing deal right now at just $29, down from $58. These shoes have laces pulled up from the bottoms rather than having eyes going across the top. They seem much more like slip on shoes rather than ones you have to untie and retie every time you put them on. These cute, comfy shoes are going to be your new faves, and you’re going to want them in every color. 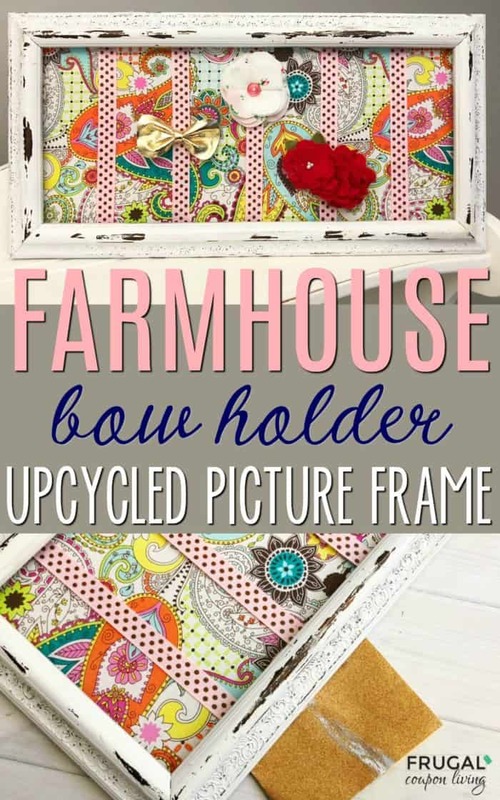 Upcycle an old frame with this Farmhouse Bow Holder craft. This hair bow holder brightens a girls bedroom or brings style to a kid’s bathroom. If you read often, you know I have five kids. The first two are girls (ages 9 and 10) and they are quickly aging out of the hair bows. The youngest 3 are boys (ages 2 and under – surprise twins). That being said, my ten years of making picture frame hair bow holders are coming to an end. I wanted to give you one last craft before we hang up our last bow and call it the end to an era! 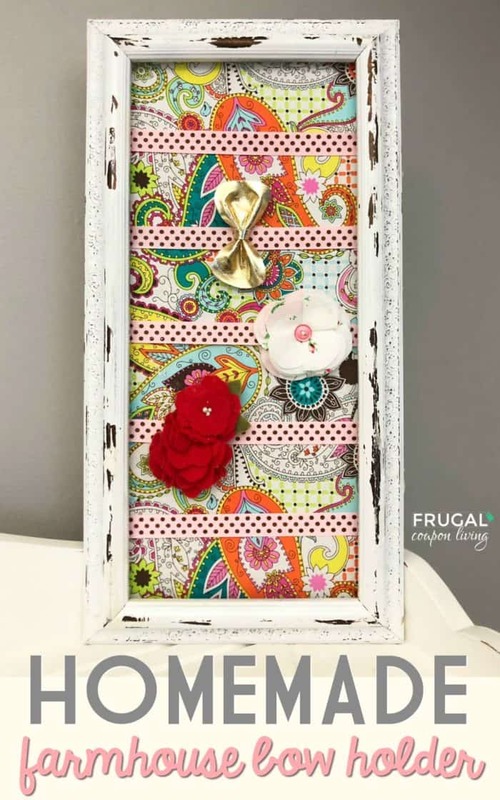 Place this hair bow holder in a kids bathroom or a girls bedroom! First, carefully take apart your frame, removing the glass and all backing like staples, nails, hooks, etc. Take your frame outside and lay out plastic or paper bags. Place your frame on top. 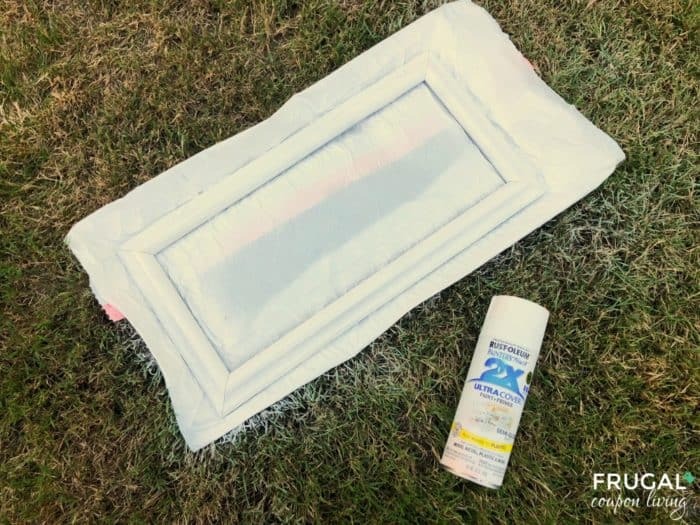 Next, spray paint your frame white (or any color you choose) and let dry. 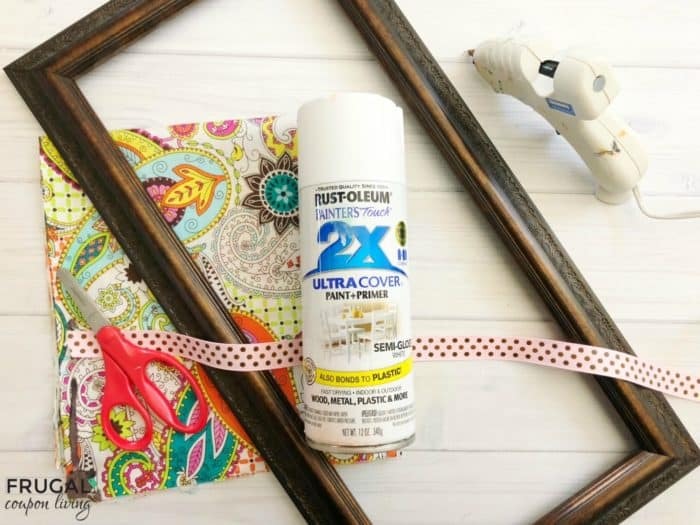 Once you frame is dry, you will want to do some sanding. 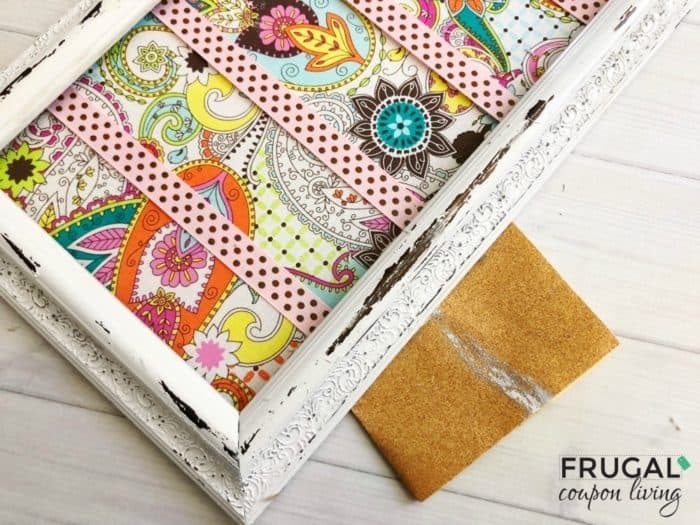 Lightly sand your frame to give it a farmhouse distressed look or keep as is. Find the perfect piece of fabric to match your child’s bedroom or bathroom. Measure the back of your frame and cut out a piece of fabric the same dimensions. Lay your fabric aside. 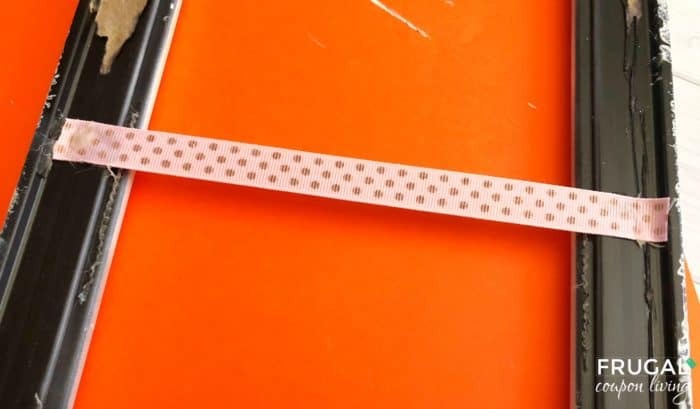 Carefully glue your ribbon across the back of the frame (make sure the front of the ribbon faces the front of the frame) leaving an even amount of space in between each ribbon to fit bow. You can do one ribbon pattern (as we have) or multiple patterns. Afterward, glue your fabric piece (front of fabric facing toward front of frame) to the frame along the edges making sure the fabric is pulled tight! Finally, if you choose, you can glue the back of the frame back on but leave the glass out. 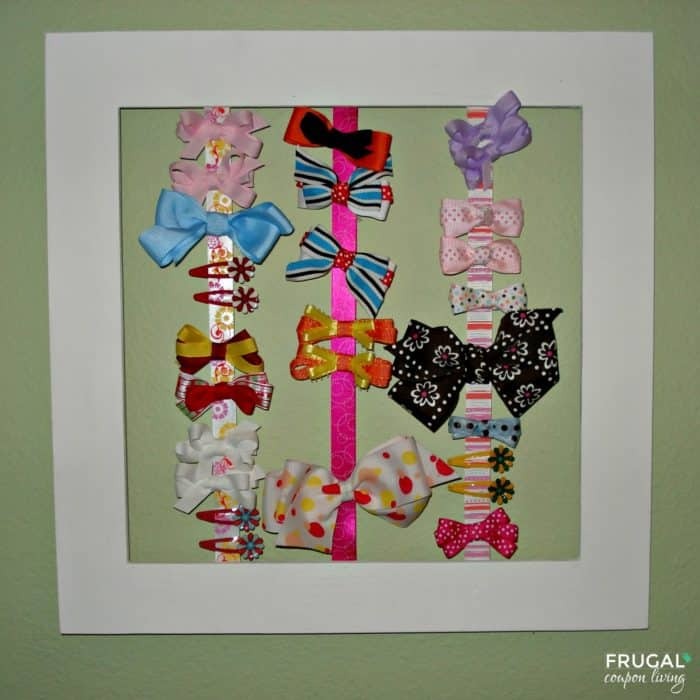 Clip your bows to the frame and display in your room. Excuse the quality of this photo. I made this frame ten years ago. I wanted to share with you another option, a bow holder without a fabric backing. I also used different patterned ribbons and allowed the color of the wall to come through between an open frame. Just consider it an option. I did find when putting the alligator clips on the ribbon, I was always attempting not to scratch or nick the all. So while the wall paint coming through was pretty. I had to be careful to not scratch up the wall! Love crafting? Take a look at these Weekend DIY Farmhouse Projects. Pin to Pinterest. 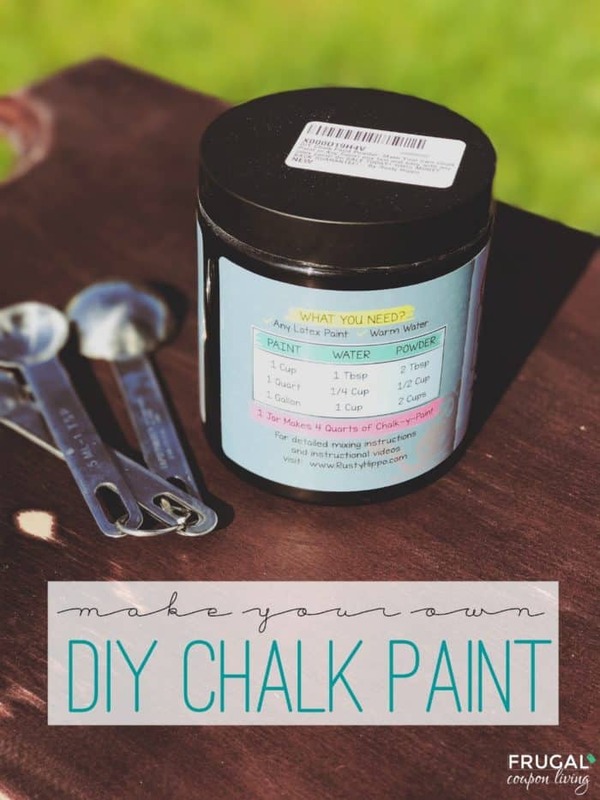 Make your own Homemade Chalk Paint. Details on our Upcycled Farmhouse Table. Pin to Pinterest. The Wilton Non-Stick Love Cake Pan can help you take your baking prowess to the next level. This item provides you with a creative out-of-the-box design. 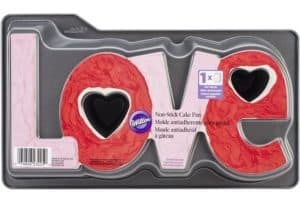 Spelling out the word “love,” this non-stick cake pan gives you the freedom to create vibrant new looks and experiment with different flavors to come up with a memorable finished product. It provides a fun way to create a cake for Valentine’s day, an anniversary or other special occasions. If you’re always looking for fun new gift ideas, this one is perfect for the bakers and cooks in your life. Get these Personalized Pot Holders and Oven Mitts for just $11! I got one of these for my daughter’s teacher for Christmas, and it was a big hit. The pot holder was super cute, and I filled it with a rubber spatula and cookie mix for her to enjoy with her kids. The personalized oven mitts are super cute, too. These cute pot jolders or oven mitts make perfect gifts for teachers, bus drivers, nurses, postal workers, UPS drivers, the mailman, co-workers, friends, family, or just about anyone you can think of! These are great housewarming or bridal shower gifts, too! Don’t miss out on these Personalized Pot Holders and Oven Mitts while they’re on sale!